Hard to believe that 2006 is almost over, isn't it? I don't know about you, but this year went by way too fast. Maybe it is just old age creeping up on me (you better not agree!). Anyway, here are the highlights of 2006 in the life of the Mueller family. Donovan had quite the year. 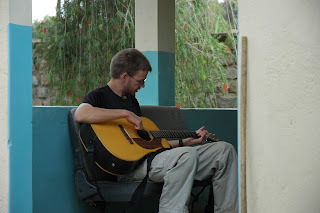 He started the year on his Discipleship Training School (DTS) outreach in Uganda and Kenya. Then it was back to Switzerland for a couple of weeks before heading to France for 3 weeks with a friend. Finally, in late April he arrived back in Mesa -- only to be off to Korea six weeks later. Donovan spent 3 months in Korea visiting a friend. He arrived back in Mesa in August, ready to stay home for a while. 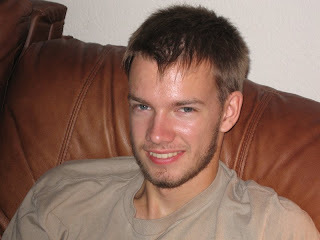 Over the past few months Donovan has been working as a web designer/programmer for several companies and organizations. His client list is growing! In January he will continue pursueing a degree in Computer Sciences in Software Engineering as well as continuing to grow his web business. For his parents, it is great to have him home again. Debbie continues to work part-time as a receptionist at Word of Grace. But her real love is throwing pots. She is taking classes at Mesa Community College, and is not only enjoying the classes and developing her skills, but also building friendships with people who are not yet followers of Jesus. 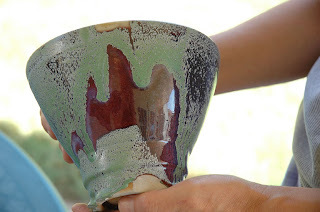 As the proud husband I can honestly say that she is getting really good, and this year she has been able to sell a lot of her creations. In August Debbie's mother passed away. So all three of us flew to Kansas City for the funeral. I've had a busy year as well. I've been to Africa twice (Kenya, Malawi, South Africa and Uganda), to Turkey once and on several trips within North America. After racking up more than 50,000 miles, I'm glad to be home! I continue to be responsible for Local and Global Outreach at Word of Grace and recently took over the young adult ministry as well. I am spending an increasing amount of my time and energy on the HIV/AIDS pandemic -- especially in Africa where more than 25 million people are HIV+. God has given us some amazing opportunities to walk alongside African Christians and churches particularly in Malawi. In 2007 I will probably be in Africa at least 3 more times. 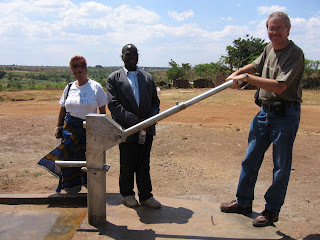 Here I am at a borehole/well we drilled for the community of Matanda in Malawi. This year Debbie and I celebrated our 25th wedding anniversary with a wonderful two week trip to the Big Island of Hawai. We had a wonderful time exploring the island, swimming with the fish and turtles, and simply being a couple. It was the first time since our honeymoon that we were just the two of us on a holiday for 2 weeks. 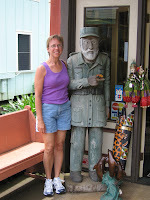 During our time in Hawaii, we also met some very interesting people -- as the pictures below indicate. We found the Hawaiians to be friendly, but a bit wooden. 1. The Myth of a Christian Nation (Greg Boyd). When 1,000 people leave your church because of your sermons two things are obvious. First, you must be preaching the truth. Second, you should write a book based on these sermons because it will obviously be a bestseller. 2. A Generous Orthodoxy (Brian McLaren). Some people love this book, others hate it. I found it to be interesting, challenging and thought provoking. Even if you don't agree with McLaren you should read this book to understand where the emerging church is moving. 3. Escaping the Matrix (Greg Boyd and Al Larson). In this book theologian and pastor Greg Boyd and clinical psychologist Al Larson bring together Biblical and neurological truths that help you understand how Scriptural principles and how God wired our brains work together. This book shows you how you can transform your thought processes to experience a deeper life in Christ and escape the world's Matrix that control you. 4. God is not . . . religious, nice, "one of us", an American, a capitalist (D. Brent Laytham). This series of essays is well worth the read if you want to be challenged about our North American perspective on Christianity. 5. If Jesus Were Mayor (Bob Moffitt and Karla Tesch) A terrific book that lays a foundation for Christians and churches to see communities transformed by the power of God through service. 6. Race Against Time (Stephen Lewis) Perhaps the most important book written on the AIDS pandemic in the last 5 years. 7. African Friends and Money Matters (David Maranz) If you are working with Africans or have African friends this book is essential reading. Africans and westerners use and manage money and other resources in very different ways. Understanding these differences will help you avoid misunderstandings, friction and conflict. 8. Cross-Cultural Conflict (Duane Elmer) If you work with people in shame-based and community oriented cultures, you must read this book. Lights go on, on almost every page. Well, I guess that is all for 2006. If you read this entire letter, you should receive a prize (you may not get one, but you probably should). Have a wonderful Christmas and a terrific 2007. Good to read about you guys and hear more about what you do! I'm glad you enjoyed your time in Hawaii, it sounded wonderful, and also that Donovan made it home safely after all his traveling. I will have to check out some of those books! Karl & Debbie, it is always nice to be able to catch up with you guys. 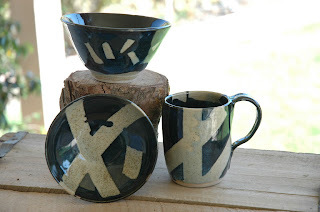 Debbie, your pots look beautiful! Karl, it seems you have found your sweet-spot with the opportunity to travel as well. We are well here in Indy. Became grandparents last year. Freaky! Donna is a student again as well as a principal. I continue to be on the road a lot. I'm learning a lot. Fond memories of when our paths crossed in the Fuller days. Peace.